TALLAHASSEE – April 6, 2017 marks the 100th anniversary of the United States’ entry into World War I against Germany. Floridians in all branches of service were sent overseas to fight in the war as part of the American Expeditionary Force, alongside service members from Britain and France. 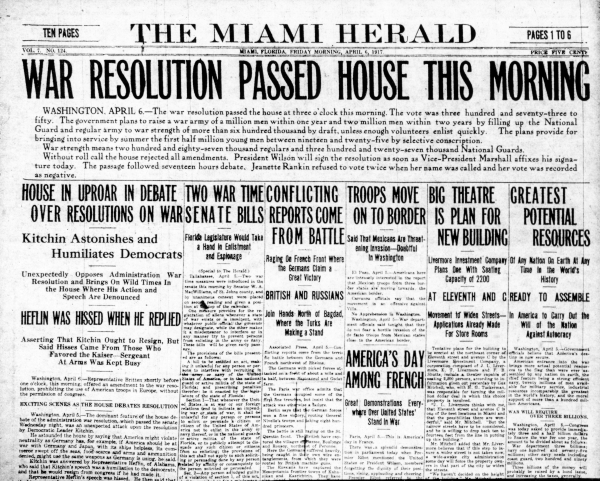 A total of 42,030 Floridians served in the war, which ended on Nov. 11, 1918, according to the Florida Historic Capitol Museum. The enlistment numbers in Florida were significant for a state with fewer than one million residents. More than 116,000 Americans were killed in the war, including 1,134 Floridians. Among those who served is the late Spessard L. Holland, a World War I veteran of the Air Service, American Expeditionary Force, who served as a county judge, State Senator and Governor of Florida during the Second World War before serving as a U.S. Senator for more than 24 years. Holland is a 2016 inductee into the Florida Veterans Hall of Fame. To commemorate the anniversary, the Florida Historic Capitol Museum in Tallahassee is sponsoring an exhibit entitled, “Over Here and Over There: The United States, Florida, and World War I.” The traveling exhibit is on display until May 21, 2017. For more information, visit the Florida Division of Library and Information Services’ World War I Resources Page.